ScriptCs is a great yet simple to use framework for writing and executing C# scripts. Beeing able to write and freely execute C# scripts is a great opportunity and can be a time saver. What I lack more at this stage of development of ScriptCs is a simple toolset to implement basic user interactions. I've sterted a new project on GitHub called ScriptCS-GUI. At the moment it holds some vanilla C# scripts but I wish to evolve it to a full featured Script Pack. As a starter I implemented classic interactions such showing an OpenFileDialog and a SaveFileDialog. In the following example the Console asks the user to select a file and then writes the selected file name. 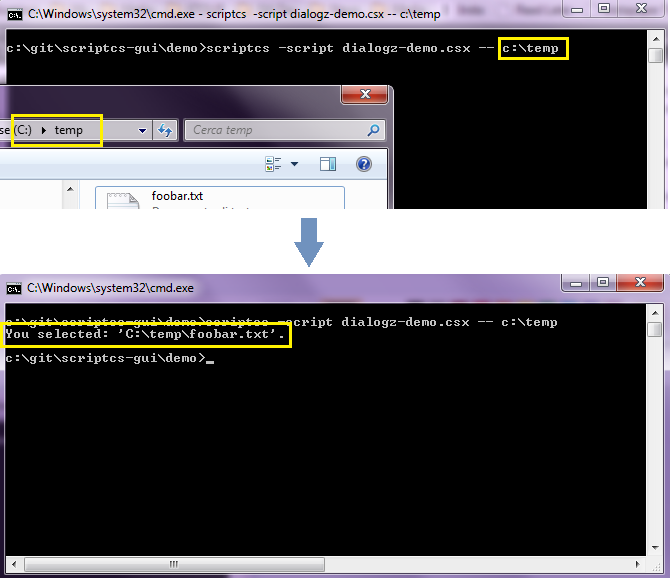 The following script shows you how to read a folder name from the command argument and use it with the Gui.OpenFileDialog helper.